Coal recently passed petroleum as the leading source of fossil fuel emissions. 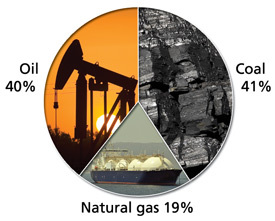 Coal contains about 77 percent more carbon, per unit of energy, than natural gas. In China, India, and the U.S., coal is cheap and abundant, and provides about half or more of all electricity. Since the bulk of coal is burned in power stations, improving electric end-use efficiency, and expanding other, cleaner sources of electricity are critical. Adopting renewable energy standards that require electricity providers to purchase wind, solar, and hydropower. Increasing funding for new transmission lines to bring renewable energy to market. Establishing greenhouse gas emission standards for new power plants. Ending subsidies for dirty fuels, and redirecting those funds to clean energy solutions. Launching government funded research and development to accelerate the commercialization of clean energy technologies. Investing in transit choices that give citizens viable alternatives to private vehicles. Accelerating the transition to electric vehicles and plug-in hybrids. Climate policy and innovative technology can combine to yield climate solutions. The Norwegian oil company Statoil began storing carbon dioxide underneath the North Sea in 1996. Since then, the company has pumped 11 million tonnes of CO2 under the sea floor. The company’s investment was driven by a Norwegian decision to put a price on carbon. As long as it was free to dump CO2 in the atmosphere, there was no financial incentive for Statoil to invent and deploy new technology. But a carbon tax of about $30 per tonne changed that. Carbon capture could reduce emissions from the electricity sector as well, but since it will raise the cost of producing power, the technology will not be widely deployed until other nations adopt similar carbon prices.